Regular readers will know that I don’t often mention news stories here. This can’t go unmentioned though. Duncan Campbell’s piece in ‘Comment is free’ points out the very patchy reporting that the death of Ian Tomlinson has had thus far in much of Britain’s press. I think that’s about to change. Please take a couple of minutes to watch this video and read this report. The video shows what seems to be Ian Tomlinson, the man who died during the G20 protests on April 1st, being pushed from behind by a police officer dressed in riot gear, including a balaclava. Unlike the others in the group, the officer who pushed Mr Tomlinson to the floor doesn’t seem to be wearing his identification epaulets, or ‘collar numbers‘, on his shoulders. I’d already left the area by this point, but were you there? Did you see what happened? The Independent Police Complaints Commission is still gathering evidence in this case. The investigation is continuing to look through CCTV footage to see whether the incident inside Royal Exchange Passage has been captured and we already have a number of witness accounts from the area. However, I would ask anyone else who saw Mr Tomlinson at about 7.20 p.m. or who may have taken a photo of him around that time to contact us so that we can build up a full picture of what happened. And who took this important video? Not the police (though they were certainly filming the protesters). Not a protestor. Not even a legal observer (though I saw at least one of those in the crowd). No, the person who filmed this was an independent bystander. He was apparently a fund manager from New York, working in London. We all need to be observers. It seems to me that we need more people taking photos of the police during events like this, not to target them with yet more anti-terror legislation such as the Counter Terrorism Act 2008. (See also this article outlining the new legislation too. Especially the comments). We need to be able to hold to police accountable, especially in tense and difficult situations like a protest. Imagine how much more difficult the IPCC’s job would be now if it were not for all those cameras in the hands of the public. If the police start using section 76 to prevent people from filming them in public, that’s a protest I’ll be attending as participant, not just an observer. Exactly the sentiment I’ve posted elsewhere Roo! As well as your reports from the day, I had other friends who were shooting pictures there too. 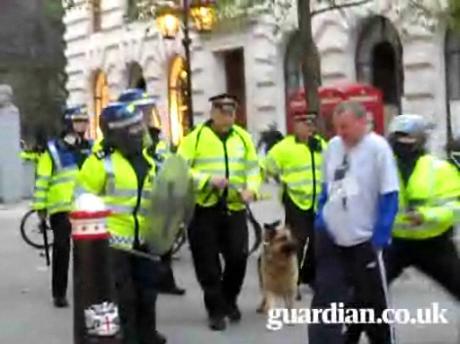 Indeed one of them felt the weight of a riot policeman’s baton himself whilst doing so! Hence I understood that there was a strong degree of “spoiling for a ruck” from some of the officers there, with their containment approach and body language. However, they still loudly proclaimed that Ian Tomlinson’s death was an unfortunate bit of synchronicity and of course that the crowds had impeded their medical attempts. Stuff and nonsense, and you’ve got to assume they’ve known that from very early on! Then add in the growing hassle that urban photographers like me are receiving for exercising our right to shoot pictures and the legislation to empower the police even more, and you wonder why a historically government supporting lefty like me is getting increasingly cross! I’ve always been very respectful to the police and the job they do to protect us but am increasingly worried than in a growing number of cases they don’t see that as their role! Tonight I’m soooooo cross and if heads don’t roll over this, especially given the findings of the Jean Charles de Menezes judgements, perhaps strong civil protest is the way forward and I’ll be joining you at it!! Personally, I think that everything the police do should be filmed by law, and (where it doesn’t infringe on the rights of those they are involved with) made available to the public. If the film is not available, the default assumption should be that they did something wrong. In terms of a crowd though “independent observers” are all well and good, but no matter how “independent”, they all have their own biases. For example, they generally want not to get into trouble, but they want to see trouble. And the trouble making element loves the attention. It’s like a big crowd of people standing around shouting “fight, fight, fight”. In this day and age of pervasive cameras, I don’t see the need for “independant observers”. I certainly think that all the protestors should be filming themselves for evidence, but protest tourists are not doing anything useful except increasing the disruption, putting themselves at risk at get a good shot, while diluting the message of the protest. At the same time, unlike real reporters, they seem to be shockingly naive about the various things that can happen on a protest. Complaining about getting held up for a few hours? That makes you a protest tourist, not a citizen journalist. I quite like some of the stuff Simon has written here and also here about protest in general, and this incident in particular. Just reading your article and I remembered a petition that was launched against photo restrictions imposed by the Counter-Terrorism Act 2008. The only way to prevent this is to sign up to the No.10 petition. Besides if I really was filming/photographing in order to gather information on potential targets does the govt *REALLY* think that I would be walking round with a ruddy great big lens on my equally ruddy big camera letting the whole world seeing what I’m carrying? I think not – this is just getting silly. In respose to the last comment – I was wondering around Westminster Bridge taking photographs on a 300 f2.8 (a ruddy big lens) on a Nikon D2x (a rudy big camera) with a huge manfrotto tripod slung over my shoulder that looked like the gun in Arnies Predator Film and no one stopped me – and that was a week after the London bombings.